Somewhere between too brassy and too ashy is that perfect golden shade all of us blondes dream of. 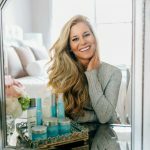 Whether you’re already blonde and looking to add some dimension, or you’ve recently decided to step over to the light side, achieving perfect blonde locks requires a pretty specific maintenance routine. I’m frequently asked about how I achieve & keep my hair color, so today I’m sharing all my tips! 1. FIRST and foremost, please go to a professional. Someone’s who’s opinion you trust, has a good track record, and specializes in color. It usually takes a few appointments for them to correct any color damage from previous salon mistakes. Hiring someone good may mean you need to stretch your budget a bit, but believe me it’s worth it. (PS, even if you’re a brunette or redhead, most of these tips are universal and if one thing is important – it’s protecting your investment and keeping your hair healthy and shiny in between salon visits!). 2. Stick to color-treated hair products. Or you’ll be washing money down the drain. A couple months ago I stopped by Salon Buzz for a personalized Fusio-Dose treatment and haircare diagnosis. 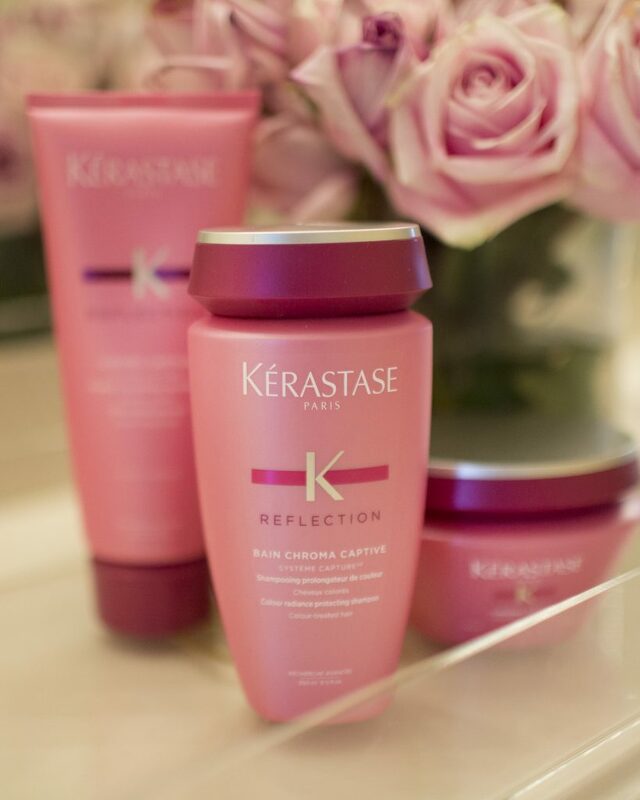 During the treatment my stylist analyzed my hair and noticed that I had damage due to coloring, so she prescribed the Kérastase Réflection Chroma Captive Collection. 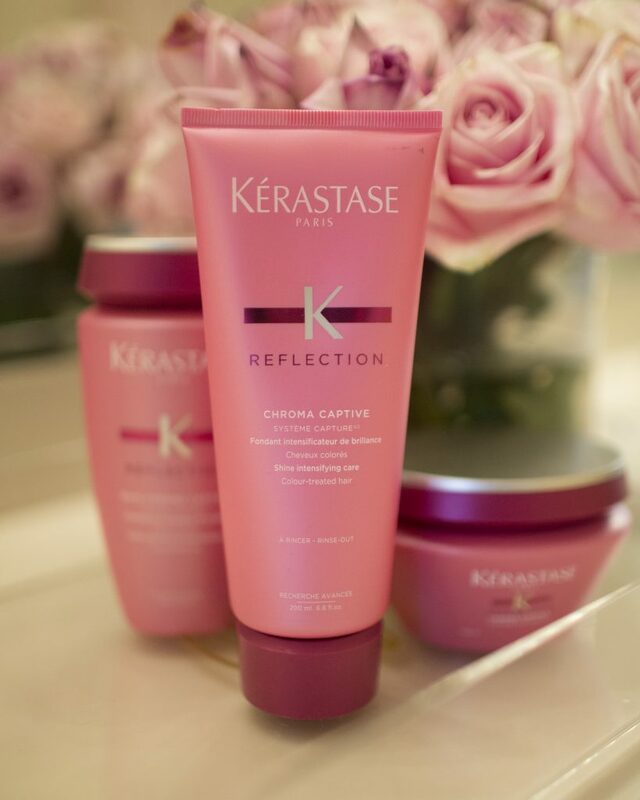 The Réflection Chroma Captive Collection is by Kérastase – a brand I love and have used for years. 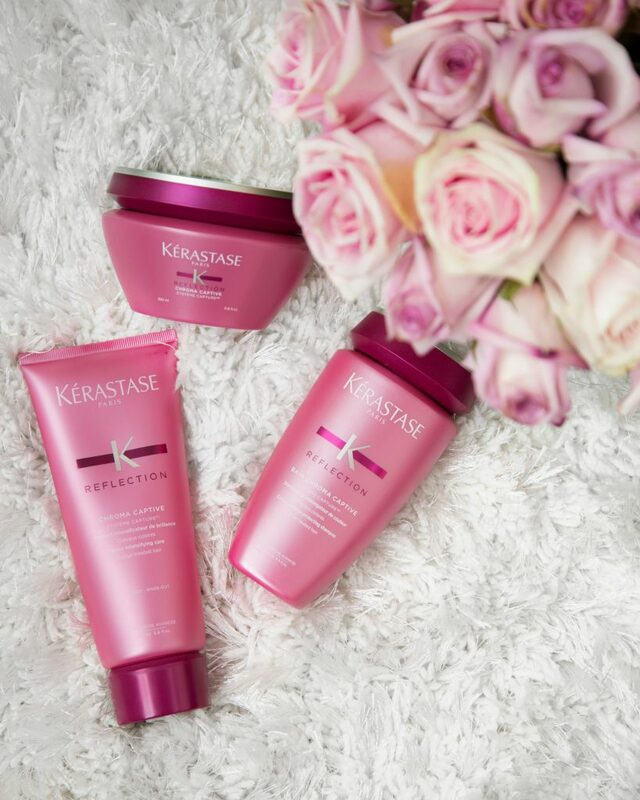 This is their most advanced line for color-treated hair to date. The collection is designed to: maintain and preserve color intensity of colored hair, nourish it and lock in moisture, provide shine and strengthen the hair fiber, give extra protection to hair color from UV rays, and leave hair feeling softer and healthier. 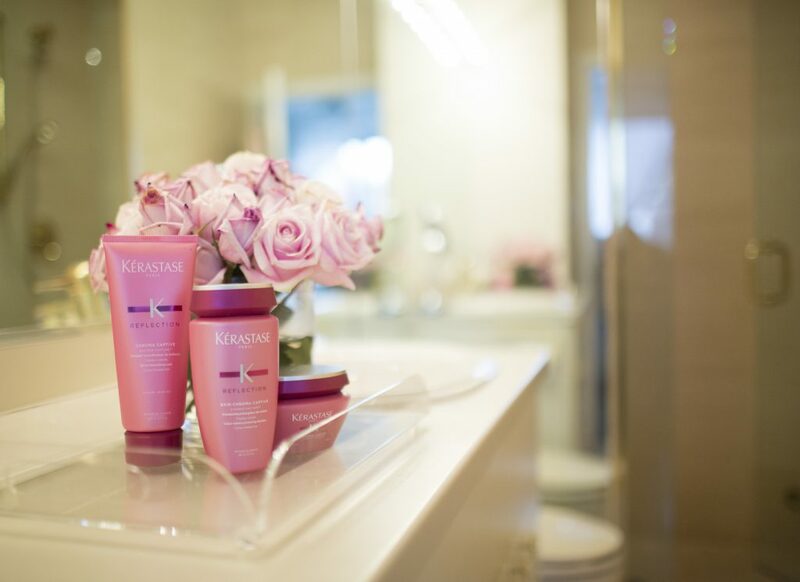 Plus, the new fuchsia/pink packaging is my favorite color – so it looks beautiful in my shower and on my vanity 😉 After using the Chroma line for 2 months, my hair is noticeably stronger, softer, healthier, and more vibrant. Healthy hair is key to beautiful color. Lay off the heat tools, blow dry on a cooler setting and deep conditioner often. I deep condition my hair 2-3 times a week. Since my hair analysis appointment, I’ve been using this deep conditioning mask for color treated hair: Masque Chroma Captive. I leave this in while I’m in the shower for 10 minutes. 4. Creating dimension is the most important part of highlighting. If you’re only using one color of blonde over your entire head, the color is going to look dull and flat. My stylist weaves my natural dirty blonde color in with a brighter blonde shade – specifically Scruples Blazings bleach with toner, SOFT GOLDEN (4 scoops, 20 volume). Adding highlights to your natural color and possibly some low lights will make your hair look thicker, shinier, and more natural. Also, the grow-out will be less dramatic and flow more naturally. The sun, product build-up, overuse of heat tools. 6. Color has so much to do with the way your hair shines. Use a light shine spray to keep the color looking vibrant – and read this previous post for all of my shine tips. 7. ONLY apply bleach to the new growth at your roots, not the ends. This is SO important. Because blonde hair requires frequent salon visits, you have to be careful about over highlighting your strands. MAKE SURE your colorist only applies dye/bleach to the new growth (!!). DO NOT coat the entire length of strands with bleach every time you get a touch-up or else the hair will become super light and damaged from over coloring. Ask your hairstylist to use a toning gloss to seal in the color and make it last longer. And PS – any good stylist would advise you not to shift your hair color more than one or two shades at a time! 9. Alternate your color-safe shampoo with a purple one. If you notice your blonde going brassy, you should use a purple shampoo -intended for hair color correction. The lilac counteracts orange therefore acting as an effective toner. 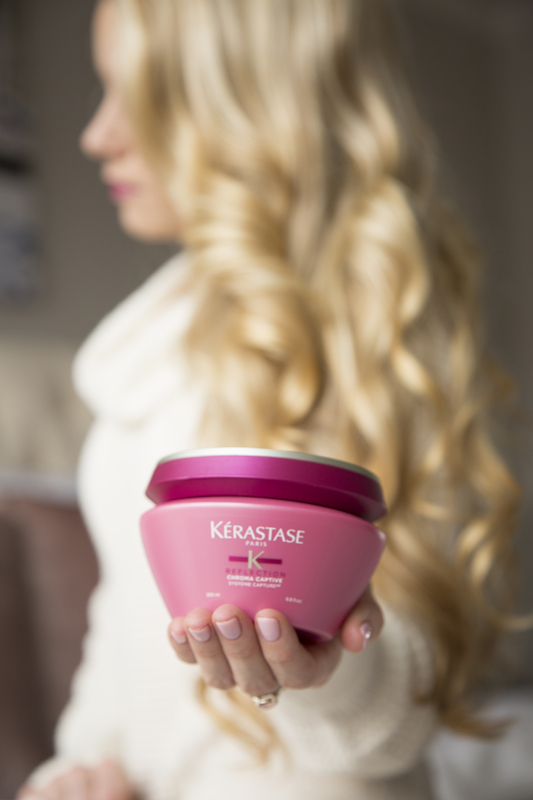 This will keep your hair from turning brassy. You should alternate this with your color-care shampoo and conditioner about twice a month – this is one I recommend! Thank you to Kerastase for sponsoring this post + providing my hair care favorites!